The X-Rite Virtual Light Booth, a component of the X-Rite Total Appearance Capture (TAC™) Ecosystem, presents virtual materials with a very high degree of realism and accuracy. This enables users to evaluate digitized materials rendered on virtual objects in direct comparison to physical material samples. The Virtual Light Booth provides diffuse and spot light sources that enable accurate visual assessment in a well-defined and standardized visual observation environment, even for highly complex materials such as special-effects paints and coatings whose color and appearance change based on the angle at which they are being observed. Includes integrated camera-based sensors, spectrophotometers and colorimeters and the synchronization of real-time rendering based on X-Rite’s patent-pending Full Immersion Technology. This ensures the most accurate available material evaluation environment. Sample motion and face tracking enables accurate viewing of surfaces that change color or appearance based on viewing angle. Physical material samples can be scanned using the X-Rite TAC7 Scanner or the X-Rite Scanning Service, or alternatively, accessed from digital material catalogs. Select, inspect and compare digital materials under multiple lighting conditions to directly compare them to physical material samples for activities such as material consistency quality assurance. Uses X-Rite mview, a real-time rendering engine based on OpenGL and optimized for rendering of virtual materials. 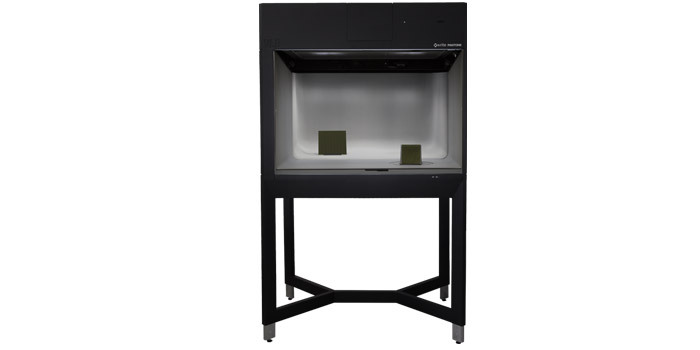 The X-Rite Virtual Light Booth, as part of the Total Appearance Capture Environment, delivers a unique and brand-new experience for evaluation of materials and surfaces. It is an immersive 3D experience unlike anything else on the market, and it will help designers, manufacturers, specifiers and others to shorten product development cycles and time to market by minimizing the need to produce and distribute a large number of physical samples.